Basic information about how CLEP can help your students demonstrate college skills and accelerate their progress toward attaining a college degree. Use the materials in this digital toolkit to inform colleagues, students, and parents about CLEP exams. CLEP exams help students get college credit for what they already know for a fraction of the cost of a college course. The program offers a flexible way for students to save time and money while they earn credit toward their degree. Download the resources below to guide your conversations with students about CLEP. This handout for educators has quick facts about CLEP and offers examples of which students would benefit most from the exams. This flyer outlines three key steps educators can take to let students know about CLEP exams. This handout created by CLEP and Advance CTE outlines connections between core aspects of CLEP exams and each of the 16 Career Clusters® listed in the National Career Clusters Framework®. The connections serve as a starting point for further discussion to align CLEP exams with local CTE programs of study. Download the materials below, or order free copies from our store. These flyers, brochures, and posters will encourage students to learn more about CLEP exams. Description: Provides info on how students free online CLEP courses through Modern States and how to earn CLEP credit. Use copy from this document to email your students about CLEP. Provides program details such as CLEP exam titles and how to register for exams. Hang this poster at your local test center, student services office, or other areas around campus to get the word out about CLEP exams. Use these examples to show how CLEP can fit into a student’s semester schedule. This flyer includes spaces where you can enter information about testing fees and the number of credits your institution grants for different CLEP exams. Download and start creating your flyer (.pdf/575 KB). Use Adobe Acrobat 6.x or later to view the flyer. Click on “Insert Institution Logo”. Go to "Tools" and “Edit Text & Images.”. Make sure it’s set to “flip on long edge”. CLEP exams are a low-risk way to earn college credit. They take just 90 to 120 minutes. There's no penalty if you don’t pass. Save time and money in college. With CLEP exams, show what you’ve learned in school or work and earn credit. Active military? CLEP exams are a low-risk way to earn college credit. CLEP is free while you’re active military. CLEP exams help you earn college credit for what you already know at a fraction of the cost. With exams in history, literature, science, math, languages, and more, CLEP can help you earn college credit. 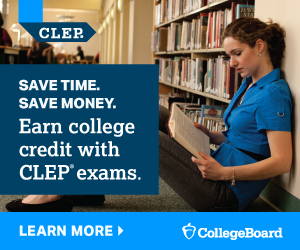 Whether you're in high school, college, or going back to school, you can use CLEP exams to earn college credit. By receiving a qualifying score on CLEP exams, you can earn college credit, save money on tuition, and enter advanced courses sooner. CLEP exams help students earn college credit for what they already know. CLEP can help students of all backgrounds save time and money on their college journey. CLEP has lined up a series of exciting free webinars designed for advisors, faculty, admission officers and testing center professionals. Visit the CLEP Webinars page to view dates and times of upcoming live sessions and to sign up. This session will focus on how to best utilize CLEP when advising college and university students. Discover ways to identify test takers, resources to promote CLEP on campus, and ways for students to prepare for their CLEP exam. Learn about the promising practices districts are using to provide students the opportunity to earn college credit through CLEP. This session will provide information on the latest data, resources for students and educators, and the process of purchasing CLEP vouchers. This session will highlight best practices for using CLEP when advising military service members. Explore ways to identify test takers, resources to promote CLEP on campus, and ways for students to prepare for their CLEP exam.